Catxalot [catch-a-lot] shows you what seaweed to eat, where to find it and how to use it. Our wish is that you will see and discover the beauty under the water, because what you love you care about. We have workshops, classes, lectures, walks and excursions about seaweed and shore plants for everyone who want to harvest seafood for home use. Many of our events can also be booked by companies and private groups. If you want to book us for a special event we would be happy to make it tailor made for you. If the dates does not fit your calender, please contact us and we will find something out. Check out our Seaweed safari on Airbnb and our Seaweed spa class, also on Airbnb experiences. Seaweed cooking class. Cooking class with and about seaweed - the new exciting vegetable of the sea. Seaweed spa class. Learn how to make products for a beneficial face and body treatment with seaweed. Seaweed Safari. Introductory course for those who want to find and harvest seaweed in a sustainable way. Ocean foodie. All inclusive ocean food experience. Seaweed foraging and cooking class. 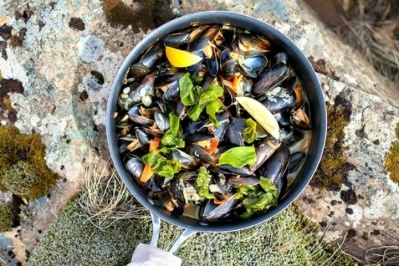 All-day course with seaweed foraging and cooking. Besides world class seafood, quaint fishing villages and picturesque boat houses, Bohuslän also has edible seaweed. There are around 325 different types of seaweed in Sweden, of which about 20 are good to eat. They all have different characteristics, flavours and textures. Seaweed contains many essential nutrients and vitamins, and can be eaten both fresh and dried. In Bohuslän it grows wild and is hand harvested by our seaweed divers. Jonas Pettersson and Linnéa Sjögren run seaweed foraging and marine tourism company Catxalot on the Bohuslän coast. It’s all done sustainably and the seaweed grows back. They then clean it, dry it, prepare it and sell it to top restaurants, ecological and organic product retailers and sell their own small product range. You will find seaweed on the menu at some of the world best restaurants and it is a healthy and sustainable superfood. Jonas and Linnéa also run seaweed cooking workshops that you can take part in, but first you should help them harvest the seaweed by diving for it – and they would love to show you how. Catxalot, pronounced ‘Catch-a-lot’, is all about “getting people to reconnect to the sea”. Take the opportunity to enjoy a seaweed safari, and find out all there is to know about Swedish seaweed. - for us, it signals something that will keep in the future. What we do today can be done tomorrow as well as in 10 or 100 years without negative consequences. It shows everything we do. It is absolutely central when we harvest wild-growing seaweeds. We do not take the seaweed with the roots. We do not use a lot of energy to dry what we picked. We dry it outdoors with the help of sun and wind, which also gives our products an even better taste. We are constantly thinking about how transports, warehousing and packaging can become more environmentally friendly, smarter and better. Sustainability is also something we think of in relation to how we work. We love what we do and want to last for a long time. This means that we must both adapt how we work and how much we work. We do not want to maximize the amount of work in life - our dream is to have so much life at work that it does not matter. We may not get there. But we try every day.